The price indicated represents the annual licensing fee, which gives your facility the right to use Titanium Schedule for the license period and entitles you to software updates and unlimited user support. With the exception of the optional features listed on this page, you get the full Titanium Schedule program. Titanium Schedule comes with licenses for five concurrent users in one center at one location. You can add additional concurrent user licenses in blocks of five as needed. If you need more than the five concurent user licenses that come with Titanium Schedule, you can order additional licenses in 5-user increments. You do not need a separate license for each person using Titanium Schedule. The number of user licenses your facility needs is based on concurrent users. That is, the maximum number of users who will login to Titanium Schedule at the same time. Note: 1st year price indicated means the first year you add a license block; not the first year you got Titanium Schedule. Note: If you opt for the Web Component feature, clients who use the Web Component do not count toward the number of user licenses. 1.3 “USER” is defined as a named individual who (a) accesses, uses, or manipulates DSM-5 contained in the PRODUCT; or (b) accesses, uses, or manipulates the PRODUCT to produce or enable an output (data, reports, or the like) that could not have been created without DSM-5 embedded in the PRODUCT even though DSM-5 may not be visible or directly accessible. Note: Titanium Schedule comes with the ICD-10 diagnostic codes from the CDC that may be used at no cost. Note: The APA requires a DSM-5 license to continue to use the DSM-IV-TR codes after June, 2013. With the Web Component feature, your clients can complete forms electronically, thus eliminating the need for your staff to transcribe data from paper forms into Titanium Schedule. Computers: Most facilities have computers or tablets in their waiting area for clients to use with this feature. Any device that will run a web browser can be used by clients. Desktops, laptops, and tablets will all work with the Web Component. Forms: You can administer Titanium Schedule's pre-defined electronic forms, design custom forms of your own, or select from a library of forms created by the Titanium Schedule user community. You can use the Web Component for a single purpose, like new client intake forms, or you can add additional options, like follow-up forms, surveys, etc. Because you can create any forms you need and administer them through the Web Component, the possibilities are limitless. This feature even supports electronic signatures, so it can be used with forms like informed consent, etc. Note: The Web Component and Client Import features provide similar functionality, so we recommend that you do not buy both features. The Web Component is the more flexible of the two and can collect much more information. Note: Clients using the Web Component do not count toward the number of user licenses needed by your facility. Your clients can use the Hosted Web Component on computers or tablets from any location, or you can restrict its use to just your waiting area. The data supplied by your clients travels to the Hosted Web Component located on our secure cloud server, then the data is automatically downloaded to your Titanium Schedule on your campus. As you can see in the flow diagram below, all data is encrypted between your client, our cloud server, and ultimately your local Titanium Schedule database. 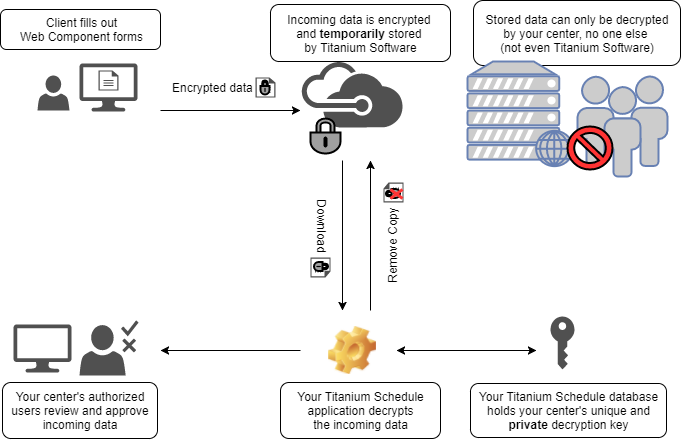 The unique data decryption key is stored in the Titanium Schedule database on your campus, so no one, including Titanium Software, Inc., ever has access to your client data while in transit. The Client Import feature retrieves selected client information from your university's student registration system into Titanium Schedule to reduce data entry. This feature requires an ODBC compliant data source and some configuration to map the incoming data fields to existing fields in Titanium Schedule. Example: When your center gets a new client, you will create a new client record in Titanium Schedule. As soon as you input the new client’s student ID, Client Import looks up that ID in your school’s registration system (like Banner, Datatel, PeopleSoft, etc.). Client Import then retrieves the student’s contact and demographic data from the registration system and fills out the appropriate portions of the new Titanium Schedule client record. If you have a teaching clinic or private practice where your clientele are community members, there is no such registration system to draw data from, and the Client Import feature will be of no use to you. Note: If you plan to use the Web Component, then you probably do not need the Client Import feature. The Web Component often gathers all information that the Client Import feature does and possibly much more. Note: This feature will NOT allow you to migrate data from another EMR into Titanium Schedule. Please contact us directly if you have this need. The Calendar Sync feature allows Titanium Schedule appointments to be copied to Microsoft Exchange, Microsoft Office 365, and/or Google Calendar. Sensitive information in Titanium Schedule, like client names, is not posted to remote calendars. Synchronization can be enabled for one, a few, or all users. The most common use of this feature is to let users see their Titanium Schedule appointments on a public calendar while away from the office by using a smart phone, tablet, etc. Note: Calendar Sync only works with Microsoft Exchange 2007 SP1 or later, Microsoft Office 365, and Google Calendar. No other calendar systems are supported. If you use Microsoft Outlook without Exchange, Calendar Sync will not work. Note: Depending upon how you plan to use Calendar Sync, this feature may not provide a full two-way synchronization between Titanium Schedule and your external calendar system. Please read our Calendar Sync Brochure for more details. Electronically transmit, print, or fax prescriptions from within the Titanium Schedule program via a secure prescription portal. The portal can be accessed by prescribers, transcribers, and viewers who have been granted rights by your center administrator. The costs shown for this feature are per prescriber per year. There is no per-prescription charge and no additional charge for access by transcribers or viewers. The prescription portal includes a dashboard for easy management of patient medications and the ability to submit electronic orders to commercial labs and review lab results at no additional cost. Note: The pricing indicated is for prescribers who require controlled substance prescribing capability. If your prescriber does not need EPCS access, please contact us for reduced pricing. The Client Appointment Reminders feature allows sending client appointment reminders by e-mail and/or SMS text message. The e-mail version of this feature is free. The text message version of this feature is $125 per year annual fee plus the cost of the messages you send. In the US and Canada, this is $1 per month plus $0.01 per message. You prepay an amount (minimum $50), and your balance will go down over time as you send messages. For example, a $50 prepay will get you between 3,800 and 4,900 messages, depending on how many months it takes to send them (because of the monthly fee). Note: Please contact us for per-message pricing if you are outside the US and Canada. The e-mail version of Titanium Schedule's client appointment reminders is free. However, if you want to send your clients appointment reminders via SMS text message, you must order the Text Reminders Service and order a Text Reminders Prepay amount (minimum $50). In the US and Canada, your prepaid amount will be automatically debited $1 per month and $0.01 per text message sent. The prepaid amount does not expire. It remains available until you use it. If the amount runs low with use, you can return to our order page at any time and add to your account. Live training is conducted via web meeting and is available at preset dates and times once a month. Sessions are two hours long, and the pricing shown is per connection to the web meeting. If more than one staff member needs to attend, the most economical approach is to order one connection and have your staff gather around a single computer and speakerphone. After installation, Titanium Schedule must be configured for use by your facility. This task should be performed by a staff member, typically the director or their designee. There is no technical knowledge required, so this is not a job for IT. We call the person responsible for configuration the System Administrator, and the training offered is for that person. Live training addresses the essentials in Titanium Schedule, but it does not cover all the material available in our free video training. Free Videos: Titanium Schedule customers have free 24/7 access to our comprehensive suite of training videos, which is designed to walk your System Administrator through every aspect of custom configuring Titanium Schedule for use at your facility. Most of our customers find the free training videos adequate to their needs. Onboard: In addition to these videos, the Titanium Schedule program has extensive internal help and access to our electronic System Administrator manual. Our team works hard to keep our videos, help, and manuals up-to-date with all the latest Titanium Schedule features. Support: Regardless of the training approach you choose, your center staff is entitled to unlimited user support at no additional charge. Live training is conducted via web meeting and is available at preset dates and times once a month. Sessions are two hours long, and the pricing shown is per connection to the web meeting. If several staff members need to attend, the most economical approach is to order one connection and have your staff gather around a single computer and speakerphone. The training offered is designed to teach your entire staff how to use Titanium Schedule. This training is appropriate for all staff members, regardless of their role at your facility. Free Videos: Titanium Schedule customers have free 24/7 access to our comprehensive suite of training videos, which is designed to walk your staff members through every aspect of using Titanium Schedule. Most of our customers find the free training videos adequate to their needs. Onboard: In addition to these videos, the Titanium Schedule program has extensive internal help and access to our electronic user manual. Our team works hard to keep our videos, help, and manuals up-to-date with all the latest Titanium Schedule features. If more than one physical location (e.g. center) will share a single copy of Titanium Schedule, enter the total number of locations in the box. Under certain circumstances, sharing Titanium Schedule across multiple locations may require a satellite campus fee to remain in compliance with our license agreement. This will be determined on a case-by-case basis, and we will contact you to assess how you plan to use Titanium Schedule at multiple locations. Please click the Back button and select at least one item before proceeding. You selected Text Remiders Service, but you did not enter an amount for Text Reminders Prepay. If you want to use this service, you must enter a minimum of $50 for Text Reminders Prepay. Please click the Back button and either remove Text Remiders Service or enter an amount for Text Reminders Prepay that meets the minimum requirement. You entered a Text Reminders Prepay amount, but you did not select the Text Reminder Service option. Please click the Back button and either select Text Reminder Service or set Text Reminders Prepay to $0. The Text Reminders Prepay amount you entered is less than the minimum of $50. Please click the Back button and set Text Reminders Prepay to $0 or an amount that meets the minimum requirement. You selected Web Component and Client Import. Getting both features is usually unnecessary. Click the Back button if you want to read the Learn More text for these features and/or change your selections. If you want to use this service, you must also enter a minimum of $50 for Text Reminders Prepay. Click the Back button if you want to enter an amount for Text Reminders Prepay before proceeding. DSM, DSM-IV-TR and DSM-5 are registered trademarks of the American Psychiatric Association and are used with permission herein. Google Calendar is a registered trademark of Google, Inc.